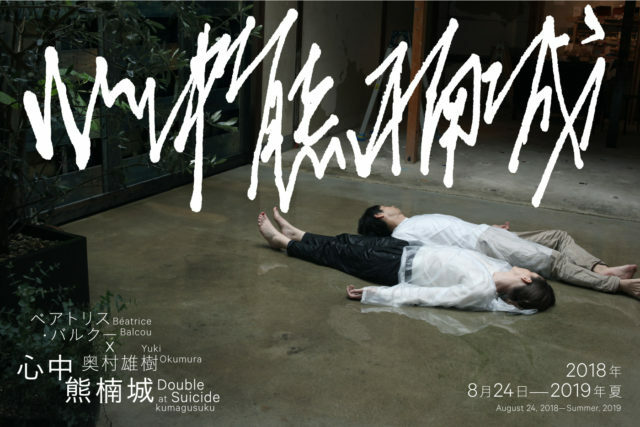 We are thrilled to announce our two-person exhibition titled Béatrice Balcou x Yuki Okumura: Double Suicide at kumagusuku, as KYOTO ART HOSTEL kumagusuku’s 5th main exhibition. We first met each other in Brussels, in the spring of 2015. It felt somewhat predestined, as we found almost miraculous similarities between each other’s practice, much more than any other artists in the world. First of all, questioning the position of the author, we both, while by respectively different means, have always mediated another artist’s work or life, and presented this act of mediation itself as our work. It might look as if a suicidal act as an artist, but that is where our artistic position lies. Secondly, in doing so, we have never “collaborated” with the artist. Our approach to another artist is certainly based on love and respect, but it is always unilateral, remaining distant and not working together directly. However, just between the two of us, based on our similar attitudes, perhaps we could find a way of collaboration, a way of working as equals. If so, what kind of form would it take? Having arrived in Kyoto in the spring of 2018, looking for an answer to this question, we first looked into the structure of Bunraku. In fact, in my practice, I (Balcou) behave like a Bunraku puppeteer. For example, in the Untitled Ceremony series, I handle another artist’s work very carefully, in order to construct an intimate situation for a small number of audience members to “appreciate” it. The protagonist is the artwork itself, manipulated by myself positioned behind it, as a body that is actually visible yet conceptually absent. On the other hand, in my practice, the way I (Okumura) narrate stories is like that of a Bunraku reciter (called Tayu). Especially in my recent works using the formats of interview and artist statement, with my single voice, I speak as various artists, re-living their lives with my own body. On a Bunraku stage, puppeteers and a Tayu (along with a Shamisen player) do their jobs in parallel, assisting each other without interacting directly, so that one same story unfolds. If so, through our own way of mutual assistance, with kumagusuku as the stage, what kind of story should we build? Born in 1976 in Tréguier, France, lives in Brussels. Recent shows include, Kazuko Miyamoto <> Béatrice Balcou at Exile gallery, Berlin (2017), Béatrice Balcou l Kazuko Miyamoto at L’Iselp, Brussels (2016), Un-Scene III at WIELS, Brussels (2015) and Walk in Beauty at Casino Luxembourg (2014). A resident at Villa Kujoyama, Kyoto, from June to August 2018 for a duo project with Yuki Okumura.